1. Wash the bitter gourd and remove the seeds. Chop into small pieces. 2. Heat little oil in frying pan and fry the chopped bitter gourd till golden brown. Keep aside. 3. Heat oil in a pan add mustard, when it splutters add cumin, garlic and onion. Fry them till golden. 4. Now add tomatoes and salt. Cover the lid and cook for few minutes. 5. Add chilli powder, coriander powder, turmeric powder, pepper powder, cumin powder and jaggery. Now add fried bitter gourd, salt and some water. Cook for 10-15 minutes. 6. 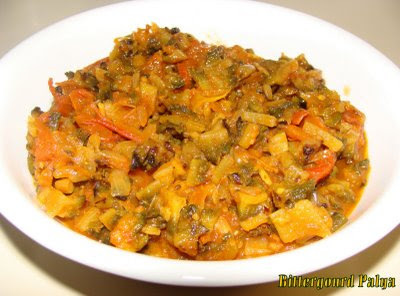 This recipe goes well with dosa, chapati, rice, rotti etc. Note: For this recipe you have to add more onions and tomatoes. ok...try bittergourd dry chutney sometime..